One of the state’s all-time small-school legends, Overstreet set a Texas schoolboy record for Class B (now 1A) with 7,652 yards and 620 points. As a junior in 1975, Overstreet rushed for 3,032 yards and scored a whopping 56 touchdowns in sparking the Wildcats to the state championship. In the process, he was named the Texas High School Football Player of the Year. In all, Big Sandy won two state titles and shared another during Overstreet’s four seasons. Overstreet’s eye-popping talent set off a recruiting war, eventually won by Oklahoma. 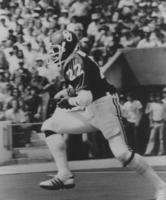 Despite playing in the shadow of Heisman Trophy winner Billy Sims -- another small-town Texas talent -- Overstreet was a first-round draft pick by the Miami Dolphins in 1981. He played two seasons in the Canadian Football League and one with the Dolphins before a fatal car accident in the summer of 1984 ended a promising career.